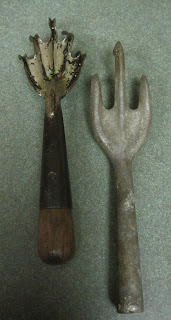 I love vintage gardening tools. Just imagine if those old tools could tell us about who used them, about the gardens they helped create, about that one winter they were left outside to fend for themselves. Oh, the adventures, the secrets those old gardening tools have locked up inside of them. What if they could tell us those secrets? What if the handle of one was hollow and inside was a little scroll of paper containing a secret? The tool on the left does indeed have a hollow handle and I suggested a few posts ago it might be holding a secret in there, scrawled on an old piece of paper, long forgotten. Remember the first five secrets for achieving happiness in your garden? Grow the plants you love, size the garden for the resources you have, buy good tools, respect Mother Nature, and share your garden were the first five secrets to achieving happiness in your garden. Then there were five more secrets including plan your garden, feed your soil, strive for balance, ask for help, and change your garden if you don't like it. And then there were two more secrets, try new plants, and plant for the future. That made for even dozen, a good place to stop. But there are always more secrets to discover, including this 13th secret. Take a break from your garden. Take a break from your garden when you are tired of tending it. Let it go for awhile. Stop obsessing over it. Ignore it. Get someone else to water it for a week or so, if need be, while you are on your break. Of course, if you live where the snow flies, you naturally get this break once the snow does start to fly because there isn't much you can do in a frozen garden once it is frozen, especially if you prepared it for winter by stowing away the stuff that doesn't like snow and ice. Winter is a nice, natural break from the garden. During the winter break, or any break, you can make new plans for the garden or even, gasp, do something other than gardening, which often leads to new ideas for the garden. Winter or not, you should really consider a break from the garden anytime you are ready to throw in the trowel or are so frustrated that you want to get a roto-tiller and plow the whole garden up. Don't do those things, instead take a break from the garden. It's the 13th secret for achieving happiness in your garden. Now I need to figure out how to get my daily dose of outside time while taking a (much needed) break from my garden! These are all good secrets. And I plan to take your advice about #13 in a very few weeks. Very good advice indeed! I think taking a (small) break from the garden energizes our creative juices again and we can come back and look at our garden with fresh eyes and perspective. I still have time before Mother Nature forces me to take a break. Until then I am still enjoying my garden chores. A good secret to happiness, Carol, very good indeed. Taking a break lets us think of the garden in a creative way, rather than job that needs doing way. A good thing. Gardens are people best friends. They bring nature into their homes, are shelter and a source of relax. But achieving peace in big towns might be quite difficult if our gardens are not well-prepared for big city traps. Wow, a redo of a, " message in a bottle! I love it. You crack me up with your posts!! A good idea! Even here in non-snow country we get a break sometimes due to weeks of rain. I hope, for several reasons, we get one of those breaks this year. So true. When I first started gardening, I thought how wonderful it would be to live in the deep south where things really pretty much just keep growing year round. Now after 25 years of gardening I wonder how those southerners keep from killing themselves with working in their gardens 12 months a year. Some time off really helps a person recharge and get ready physically and mentally for another go around.